Dean Safe has been around since the 1970’s and those who have been around since that time are very aware of the services provided by the company. 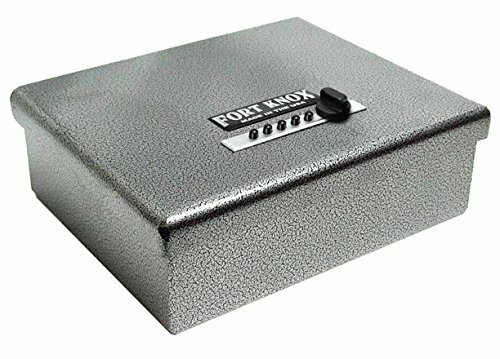 One of their popular products in the recent times is the Fort Knox PB1 Handgun Safe that has been designed with the changing needs and requirements of storing a pistol. This Safe has been designed in such a fashion that it makes breaking in impossible just because of its brute strength and impregnability. The reliability quotient of the safe makes it all the more desirable as it adds to the value of the product. The specifications and features of the gadget are discussed below. It has been built with a 10 gauge steel body and a 3/16’’ wrap door making it virtually impossible to even make a dent. A lock with 1081 different combinations which is, in fact, the tried and tested Simplex push button mechanical lock gives the ease of use to those using the system. The main idea of giving a safe place for keeping guns is the over encompassing idea behind coming up with this system as the system is absolutely safe and easy to access in times of need. The hinge which is of paramount importance is appropriately placed under the door in order to protect it from any outside attack. The interiors are made with foam resting on the lower base of the floor of the safe. The inner architecture of the safe protects the gun from getting any scratches or damages onto itself. Depending on the size of the gun, one can easily fit in one gun and possibly two. The inner structure of the safe has been made in such a fashion that with adjustments two guns of moderate size can be placed side by side. A lifetimes warranty is given with each of these safes, thus exhibiting the sturdiness and robustness associated with each safe. The California Department of Justice firearm safety device requirements has certified this safe for its extreme quality as this is the best value for money. This gives it a tag of being a strong sturdy safe where one can keep firearms at ease and also where someone can easily access in times of an emergency. The entrance of the safe is of paramount importance and way to the inner chamber opens is gas strut assisted with a heavyweight door on its face which is so robust that penetration or breaking in almost ruled out. The door is the heaviest component of the entire safe and has been on purpose made so to make reliability the USP of the safe. The safe can be opened by using the fast opening push button mechanical opening device and not a combination of passwords or number combinations which need to be memorized. This feature ensures the ease of use as when needed in times of emergency, the gun inside can be accessed at the earliest and in the fastest possible manner. Drawing the gun has been made simpler as the gun rests on a foam bed which has the contours of the gun shaped on it. The most important thing in terms of convenience is that one can permanently fix it on a drawer or on the floor. The pre-drilled holes at the bottom can be used to bolt it down to the floor, a drawer or any flat surface where one wants to permanently keep it. This ensures the permanence of the position of the safe with respect to its ease of access. The weight of the safe is around 22 pounds which are quite lightweight and can be carried easily. The actual need to have a safe is to keep valuables safe and secure. This gun safe does this very well as it serves the purpose of its purchase. The mere robustness of the safe gives the impression that it is the best place to keep your valuables as it is near impossible to break in however strong the effort. The space inside is good enough for two guns to be placed along with their cartridges side by side. When travelling one can carry it along with oneself and also secure it to a permanent place in the house if required. The easy to use locking system without the mumbo jumbo of passwords and electronics ensures that the contents can be easily accessed when required. The inner design ensures that the articles of value do not suffer any damage. The market has several such products that can be used for the same purpose. One such offering is the V-Line Brute Heavy Duty Safe with Quick Access Lock, Black. This product is equally good and can be used to store moderate sized pistols with ease. However, Fort Knox is more portable and can be conveniently used for quick as well as easy access. It also features a quick and robust locking system which is less complicated than several other safes available in the market. The promising performance of the Fort Knox PB1 Handgun Safe coupled with its robust features is something which is sure to appeal to those who are looking for the security and safety of those at home. The easy to open system and the fact that is unbreakable goes a long way in providing the customers the features that they look for while purchasing a gun safe.